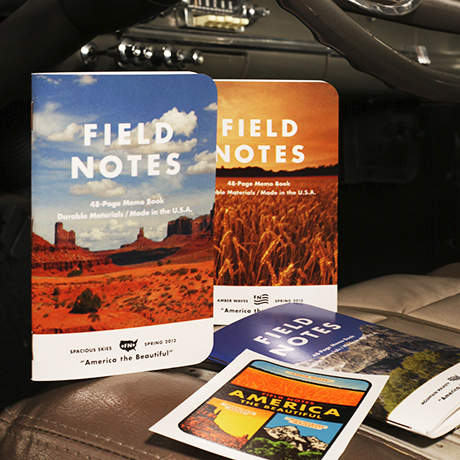 Field Notes.. My favorite notebooks have issued their new colors subscriptions pack today. As the infomercials say: that’s not all! 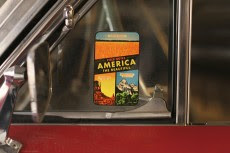 Each 3-Pack includes an “America the Beautiful” water-transfer decal inspired by the ubiquitous decals that mid-century tourists proudly applied to their Samsonite, Airstream, or Chevy Bel-Air. The decal is screen-printed in fluorescent colors on a clear backing, waiting to be briefly soaked in water and applied to an inviting, soon-to-be-more-attractive surface. Field Notes: America the Beautiful Edition from Coudal Partners on Vimeo. Now some of my own. I LOVE THESE! so much, that I have ordered a few for giveaways. So to enter, send me a postcard of something travel related in a touristy fashion. That would be as described above. Examples would be, the Jackalope etc. I will add to this post tonight.. something you might find at a bus stop, trailer park, truck stop you know what I'm talking about. I will be posting ALL of them as received. Up for grabs. 1 full pack and decal of the new books. I have 4 sets to give away. This will end April 15th. Hey I figure something good should happen then. OH HOORAY! LOVE ROAD TRIPS, AMERICA THE BEAUTIFUL. I'M AN OLD RTE. 66 TRAVELER. LOVE TO TRAVEL THE LONELIEST ROAD IN AMERICA: HIWAY 50 IN NEVADA. SOME OF THE MOST REMOTE ROADS IN THE COUNTRY. HOPE I WIN. THE POSTCARD WENT OUT IN TODAY'S MAIL. Hahaha! Imagining a giant rooter rooter. Scratching my head. Hmm. What do I have . . . These look great!! I'm waiting for some of my own to arrive in the mail, but I'll enter the giveaway too. Just visited a souvenir shop in Biloxi the other day for the express purpose of buying touristy postcards, so you're in luck! Would you like your own piece of Calligraphy? Mail goes out and product comes in.